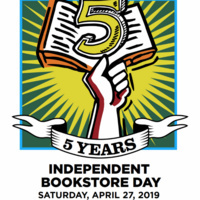 Edmonds, Washington, April 27th, 2019 Independent Bookstore Day marks its fifth year of celebrating independent bookstores nationwide on Saturday, April 27th, with literary parties around the country. Edmonds Bookshop will also offer exclusive day-of merchandise created especially for Independent Bookstore Day by major publishers and authors. Since its inception in 2014, more than 200 authors have demonstrated their support for independent bookstores by donating work for Independent Bookstore Day. Edmonds Bookshop will celebrate with Seattle Independent Bookstore Day on April 27 this year, the fifth annual observance of this popular national event. Seattle Independent Bookstore Day (SIBD) continues to grow, attracting hundreds of visitors to more than 20 participating bookstores in the area and offering a range of activities from in-store parties, limited edition merchandise, and giveaways. On April 27, fans can pick up a SIBD Passport at any of the participating stores and use it to collect a stamp at each store during the day as proof of visits. Those who have their passports stamped at three or more stores will receive a coupon good for a one-time, 30 percent-off discount at any one of the participating stores. participating stores on April 27 will receive a Champion Card entitling them to 25 percent off at all participating stores for a year. In 2015, 42 valiant souls made the trek; by 2018 that number had grown to nearly 500 bookstore champions. This year’s milestone SIBD celebration is expected to be another record year.